If you follow us on Twitter or Facebook, you know that we spent much of the past weekend at the annual Heritage Music BluesFest in Wheeling, WV, now in its 14th year, the line-up for which included Tab Benoit, Robert Randolph, Ana Popovic, the Spin Doctors, Billy Branch & Lurrie Bell, Damon Fowler, Indigenous, and more. Here are a few reflections and photos on the weekend, with more pics to be posted soon in our BluesPowR Gallery! Most impressive new act: Third-place International Blues Challenge (IBC) finishers Billy the Kid & the Regulators got the festival off to a fine start Friday evening with a nice mix of tunes from both their current and upcoming (being recorded in September and produced by friend Damon Fowler) CDs as well as covers that included the Steve Miller Band’s “Fly Like an Eagle”, the Spencer Davis Group’s “I’m a Man” that brought Billy out into the audience, and an encore number of the Ides of March’s driving “Vehicle”. And we loved what we heard from IBC solo winner Tim Williams, who helped ease the crowd into Saturday’s performances with tunes from the Rev. Gary Davis (“Poor Boy”), Clyde McPhatter (“A Lover’s Question”), Blind Willie Johnson (“Nobody’s Fault but Mine” and “Dark Was the Night, Cold Was the Ground”), Robert Johnson (“Malted Milk”), Blind Boy Fuller and Sonny Terry (“Custard Pie”), and the Mississippi Sheiks (“Sitting on Top of the World”), in addition to a few songs of his own, capping it off with “Wee Midnight Hour Blues” for an encore. 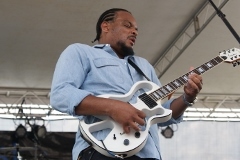 But no one was more dazzling than blues newcomer Jarekus Singleton, whose hard-hitting debut album with Alligator Records Refuse to Lose is currently burning up the blues music charts much the way the Mississippi native himself did the BluesFest stage Saturday, from even his warm-up song of “Big Legged Woman”. 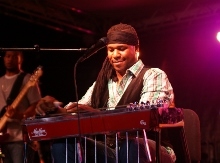 Singleton started his set on the shuffling “Come Wit Me”, taking it “to the juke joint” with a funky “Gonna Let Go”, before sliding into the slow bluesy soul of “Crime Scene”, which is exactly what Singleton and his band – including Sam Brady on B3 – were creating, killing it like they were. From there, they moved to the driving “Keep Pushin” and groovy “Singing the Blues” (from his 2011 independent release Heartfelt), closing out the set on the rocking title track from his new album with its confident lyrics of “y’all ain’t caught on to it yet, or maybe this time you won’t forget, I win at whatever I choose, ‘cuz I refuse to lose”, and then returning with an equally powerful encore in “Suspicion”. Favorite set overall: You can always count on Saturday night headliner Tab Benoit and Sunday night performer Ana Popovic to deliver solid shows, and it was hard not to like the energy of Friday night closer Robert Randolph & the Family Band, who seemed in particularly fine form on what happened to be Robert’s birthday, including inviting Indigenous’ Mato Nanji back to the stage on “Voodoo Child”. This was the first time we had a chance to catch Florida guitarist and singer Damon Fowler live, and we have to say he didn’t disappoint, kicking off his set with the double-entendred “Fruit Stand Lady” before diving into his latest album Sounds of Home with the breezy “Spark”, the slow, Blues Blast Music Award Song of the Year-nominated “Old Fools, Bar Stools, and Me”, the groove-filled title track, and a biting “Grit My Teeth”. 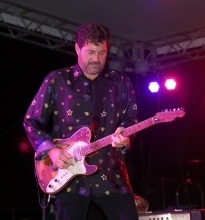 Fowler also paid tribute to the late Johnny Winter with “Broke Down Engine” (Blind Willie McTell) and played a trio of songs from his earlier Sugar Shack album: “I Hope It’s Gonna Rain” and Merle Haggard’s “Tonight the Bottle Let Me Down”, then switching to lap steel for the set-closing title track, returning on lap steel again for the encore number of “Shake Your Moneymaker”. 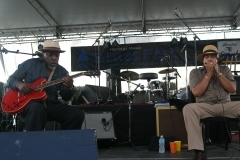 But the biggest treat of the weekend for us was getting to see two Chicago blues legends – guitarist Lurrie Bell and harmonica player Billy Branch – together on the same stage like the old friends they are, having begun working together in the 1970s when they – along with bassist Freddie Dixon – formed the Sons of the Blues (which since has become Branch’s backing band, with Bell having left the group in the early 1980s). Taking turns on vocals and solos, the pair rolled through a wonderful selection of blues classics, from slow, creeping numbers like “As the Years Go Passing By”, “Last Night (I Lost the Best Friend I Ever Had)”, and “She’s Nineteen Years Old” to such movers and shakers as “Don’t Start Me to Talkin'”, “My Babe”, and “Got My Mojo Working”, also hitting on tunes like “Nobody Wants to Lose” and “Wine Headed Woman” along the way, topped with an encore of Junior Wells’ “Messin’ with the Kid”. This entry was posted in Shows and tagged Ana Popovic, Billy Branch, Billy the Kid & the Regulators, Damon Fowler, Gracie Curran & the High Falutin' Band, Hadden Sayers, Heritage Music BluesFest, Indigenous, Jarekus Singleton, Lurrie Bell, Mato Nanji, Matt "Guitar" Murphy, Nouveaux Honkies, Robert Randolph, Spin Doctors, Tab Benoit, Tim Williams. Bookmark the permalink.